English synthpop duo Hurts smashed into the mainstream in 2010 with their debut album, Happiness, reaching the top ten in several European countries. Exile is a satisfyingly epic sophomore effort. Not all of Exile goes to dark places though. The upbeat, catchy “Blind” features falsetto that makes it sound interchangeable with beloved British “man band” Take That. “Somebody to Die For” is quite the ballad, but the lyrics don’t quite have the strength of the swelling music. 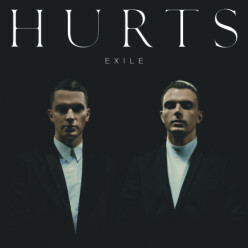 As far as follow-ups go, Hurts have demonstrated that they have a finger on the pulse of the European pop scene. Hopefully their next effort will have better lyrical content to match the impressive instrumentals they manage between their two members.